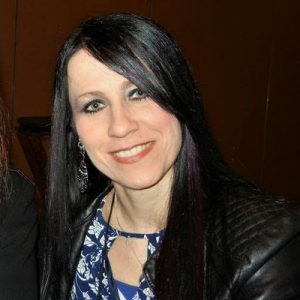 Contributor: Rachelle Dene Poth, Language and STEAM Teacher at Riverview High School in Oakmont, PA. 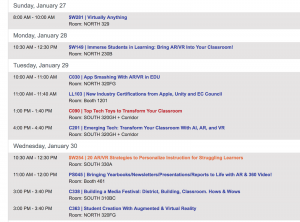 There are a lot of topics that are going to be quite popular this year at FETC and one area that I’m always excited to learn more about is Augmented and Virtual Reality (AR/VR). It’s amazing how many new apps keep coming out and the number of stories that flood my Twitter feed each day about how Augmented and Virtual Reality are being used in classrooms around the world to immerse students in learning. The use of AR/VR is about providing powerful opportunities for students to have more control in learning by being able to travel around the world, explore places and objects more closely. Using these technologies build on student skills such as critical thinking, and problem solving and enables students to become creative in designing their own experiences. Whether you are just getting started or have already been using these tools, you will find a lot of options at the conference this year. Doing a quick search of the program turns up a lot of different sessions that focus on AR/VR together and also on each topic individually. Whether you want to spend a lot of time and participate in a Hands-On workshop or prefer to interact with several different presenters in the poster sessions, or anything in between, there are a lot of choices. Besides attending any of the different sessions, there will be also be many opportunities lot to learn by spending some time in Expo Hall. Without a doubt there will be representation there from some of the edtech companies creating the different AR & VR apps and also the accessories that go with them. A great opportunity to connect and ask questions, share your ideas and take time to explore what they have available. Some of the companies that will be represented include: Nearpod, CoSpaces, Merge, Google and Microsoft, each offering great options for AR/VR and sure to have a lot of information and opportunities to explore while you are there. Educators who use the tools will also be available to answer questions about getting started in the classroom. Scanning the program shows some additional tools and technologies that presenters will be sharing. In addition to the expo hall booths, you can find information about other tools such as 3D Bear, Figment AR, Metaverse, Storyfab, Thyng, Shapes 3D are more. The best part about these tools is that they are not specific to any one content area or grade level. They can be used as a quick way to give students an opportunity to really explore a place being studied, to interact with something virtually rather than learning through books or by simply watching a video. Start with searching in the program agenda, and enter the keyword “reality.” It will display more than 30 different sessions available on the topics of augmented and virtual reality. Beginning early on Sunday, there are 5 workshops available focused on Virtual Reality and an additional 3 on Augmented Reality. There are some great options available each day of the conference, and some which focus specifically on the use of one tool for exploration and creation, and others that will focus on the topics of AR/VR and MR and will provide many different tools for bringing these into your classroom. I am excited to present again this year. At FETC 2018, I was fortunate to co-present with Jaime Donally, author of the book Learning Transported, a must read for anyone looking to get started with AR/VR in the classroom or anyone already using these tools and looking for more ideas and lesson plans. In January, I will be presenting several workshops and sessions on the AR/VR and AI tools that I have used in my classroom to engage students more in learning and some which had students as the creators, enabling them to really immerse in learning. As a STEAM teacher, I am fortunate to be teaching students about emerging technology and these tools have really been beneficial to the 8th graders who are learning to interact more with tech, as well as students in my Spanish courses, who have created truly authentic and meaningful representations of their learning. Coming to FETC is always a must with so many options available for cutting edge technologies, methods and learning. Start thinking about your own personal goals of how you would like to use augmented and virtual reality in your classroom, or even with faculty or members of your school community. The use of AR/VR is not specific to any grade level or content area and can be fun and engaging for everyone to explore and learn from. I am looking forward to time to present with and learn from members of my PLN and walking away with a ton of new ideas! Hope to see you at some of these great sessions, be sure to say hello and check out all the great resources the presenters will be sharing in January! Share your learning and tag me @Rdene915! See you in Orlando!